When you’re looking for ease of use and an excellent variety, there’s nothing quite so effective as medibles. At CannaSource, our cannabis store and dispensary carries a wide variety of medibles to meet your needs. Many patients prefer this method of consumption for a variety of reasons. With a medible, you get much more than just a great delivery system, you get great eats too. We work with local artisans to procure the best handcrafted medibles, ensuring you get quality, potency, and flavor. Ease of Use – Since the dawn of time eating has been one of the easiest ways to imbibe medicine. Many of our patients either cannot, or do not enjoy consuming natural medication in a vaporized or smoked form. 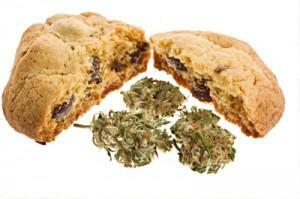 Medibles in Portland can take many forms and we carry them all. Tinctures are incredibly popular as are our baked goods and sweets. We also have a variety of butters and oils that can be eaten raw or easily integrated into your favorite recipe at home. Variety – When it comes to our selection, edible medibles in Portland are only limited by the imagination of the creator. We have an extensive menu including bars, lollipops, taffy, chocolate, extracts and baked goods in a variety of THC percentages. Whether you’re looking for a light snack or the perfect medicinal delivery system, medibles are a great choice. Dosage – A patient trying to achieve a specific dosage can have a difficult time with flowers. Medibles Portland don’t require the same care. Depending on what you purchase, taking the proper dosage can be as easy as “eat one.” Since the majority of the products are made with oil, the THC and CBD per mg are evenly distributed. This makes simple math much easier to do since you know exactly what the product weighs. Some basic division will tell you exactly how many miligrams of each are in your serving, and we’re happy to help you identify the right dosage for you. With so many options it’s easy to see what makes medibles Portland such a great choice. For a wide selection, excellent prices, and a knowledgeable staff call (971) 254-4374 or Contact Us today.